Opposition spokesman for defence Richard Marles has tipped the Labor Party to fully support the ongoing development of Australia's defence industry. In a speech to the National Press Club, Marles revealed he is expecting the party to back the industry at the upcoming ALP National Conference in Adelaide this July. Enabling Australia to project its strategic weight through an exporting defence industry. "At its best Australian industry is as capable as any in the world. If we believe we have or can develop the world’s best capability in any given area then this is reason alone for Australia to have a defence industry so that the ADF can have access to the best," Marles said. The former parliamentary secretary for Pacific Island Affairs and parliamentary secretary for Foreign Affairs has called on Australia to follow in the footsteps of Israel as it looks to develop a defence industry focused largely on exports. "At the heart of Israel’s rationale for a defence industry is a fundamental confidence in its own ability to build the best in order to make the IDF the best," he said. "A dull acceptance of Australian industry inferiority, without any attempt to improve it, is inexcusable." Marles said Australia's success with the Bushmaster, Nulka and the Jindalee Operational Radar Network bear testament to what could be accomplished should Australia make a commitment to having a national defence industry. "The decision to have a national defence industry is not lightly made. If you want to have a national defence industry then as a nation, at every level, we have to commit to it," Marles said. "The visit to Israel left me deeply impressed by what that nation had achieved but more than a little discombobulated about the state of Australia’s endeavours in developing our own defence industry." Elbit Systems, Rafael and Israeli Aerospace Industries are some of Israel's leading defence companies. Around 80 per cent of the revenue of each of these companies is currently export based. The latest Stockholm International Peace Research Institute (SIPRI) report looking at trends in international arms transfers has Israel ranked in eighth place, while Australia sits in 19th. Defence Industry Minister Christopher Pyne and the Turnbull government earlier this year committed to getting Australia in the top 10 with its new Defence Export Strategy. 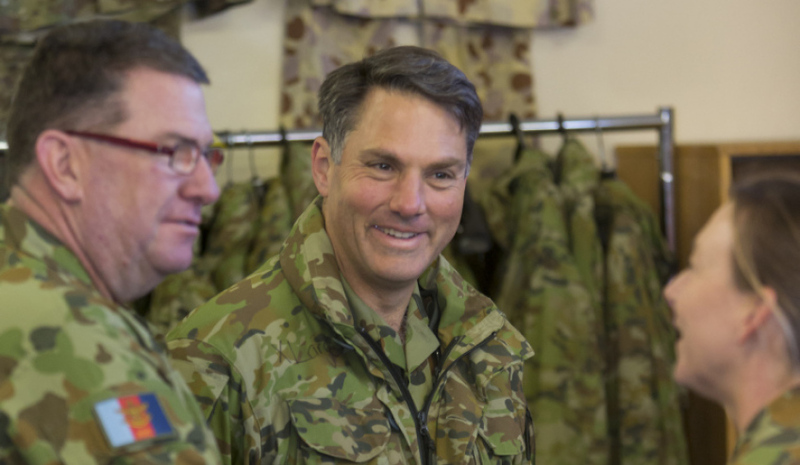 However, Marles has lashed the current practices within Defence's Capability Acquisition and Sustainment Group (CASG), arguing it does not allow for the development of a strong export based Australia's defence industry. He said this "orthodoxy" was seen most recently with the Offshore Patrol Vessels procurement. In November the government announced it had reconfigured the tender for the OPVs, selecting German designer Lürssen and its teaming partners ASC and Civmec, but pairing it with Western Australia's Austal. Marles labelled this mix of bids a mistake and said the government abandoned the government's commitment to developing Australia's defence industry capability. "Given the current orthodoxy in the way in which CASG procures for the ADF, an orthodoxy which does not prioritise the development of Australian defence industry, and an orthodoxy which has not been altered by this government despite its rhetoric, this decision is wholly to be expected," Marles told the National Press Club. "And yet do we imagine for one moment this is how it would have worked in Israel or Britain? Can we imagine either country so easily accepting the loss of this defence industry development opportunity? And can we imagine them allowing a situation to develop where the choice became one of a superior foreign capability over an inferior domestic option but nevertheless a development opportunity?"